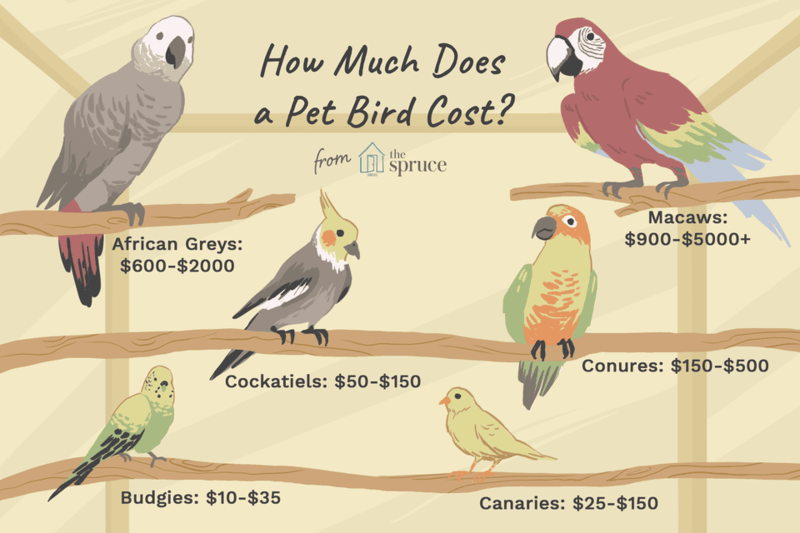 How Much Does It Cost to Buy and Care for a Pet Bird? How much will it cost to buy the bird you want? It depends on the species, and whether you buy from a professional breeder or another source such as a pet store. Beyond the cost of the bird itself, new owners should budget for things like pellets and other dietary needs such as seeds and fruits, properly-sized cages and even bird-proofed rooms for larger birds to fly around. Depending on the breeder, availability and your location, the cost of your bird may fluctuate outside the given ranges. The list also includes some of the other expenses you should plan for while caring for your new feathered friend. In general (depending on the breed), housing, feeding, and caring for a bird is less expensive than caring for a dog or cat. But the costs can rise dramatically depending upon the lifespan of the bird (some birds live as long as people) and your pet's healthcare needs. Larger birds such as macaws and parrots are much more interesting pets than parakeets, but they are also more expensive to buy, house, feed, and care for. While it's possible to buy a birdcage for a macaw for under $200, chances are it will need replacement relatively soon; it's probably smarter to budget at least $300 just for that purchase. Budgies (Parakeets): $10 - $35. Since they're small, budgies are relatively inexpensive to care for and feed. But a diet consisting only of seeds is not enough; veterinarians recommend a diet that includes pellets, fresh fruits, and vegetables including leafy greens. Canaries: $25 - $150. In addition to what you'll pay for the canary, make sure you have the right size cage for these active birds. They need room to fly around and plenty of toys since they can get bored easily. Finches: $10 - $100. Most finches prefer the company of other finches to that of a human companion. Ideally, they're kept in small "flocks" when in captivity. So if you're planning to get a pet finch, you may want to get more than one to keep your bird emotionally healthy. Parrotlets: $100 - $300. The average parrotlet can live up to 20 years or longer, provided it's well cared for. Be prepared to make that kind of commitment to a pet before getting a parrotlet or any other variety of parrot. Cockatiels: $50 - $150. These very social birds need regular interaction so that they stay tame. Talk to them and handle them on a daily basis. Conures: $150 - $500. In the wild, conures eat fruit, nuts, and seeds, but in captivity, they need a balanced, pelleted diet supplemented with nuts, seeds, and fresh fruit and vegetables. Make sure their food (and their cage) is thoroughly washed regularly to prevent transmission of parasitic infections. Doves: $20 - $100. These easygoing birds need exercise, and not just within a cage. Bird-proof a room in your house that allows the dove to fly around for at least an hour a day. The room should be free of easy escape routes and common household hazards. Lories: $400 - $900. Unlike the other members of the parrot family, lories need nectar in their diets, since that's their primary source of nutrition in the wild. The nectar formulas, available from breeders and specialty pet shops, can be part of a diet that includes fresh fruits and vegetables or even edible flowers such as dandelions. African Greys: $600 - $2000. Because they are so intelligent, African Grey Parrots can be quite emotionally needy. They require frequent socialization and exercise, so your home will need a parrot-proof area where the bird can spend several hours each day. Cockatoos: $800 - $5000+. All cockatoos struggle with weight gain, so owners should monitor their fat intake. High-quality pellets, a moderate amount of seed mix and daily helpings of fresh, bird-safe fruits and vegetables that have been thoroughly washed are the ideal diet for cockatoos. And they need a minimum of three to four hours outside of the cage every day, as well as chew toys to exercise their beaks. Macaws: $900 - $5000+. When macaws get bored, they chew on things, so make sure your bird is getting enough stimulation. These are expensive and high-maintenance pets that require a significant time investment from owners.